2 ply or not 2 ply, that is the question.. Since Wednesday’s post I’ve continued working with the gorgeous Manos Del Uruguay hand dyed rovings in the “wildflower” colourway on the spinning wheel, and I’m reeeally hoping I can magically transform them into a winter sweater. There’s just one teeny weeny problem though, and that is… *drumroll please*…2 PLY OR NOT 2PLY??? So this is what I have so far. 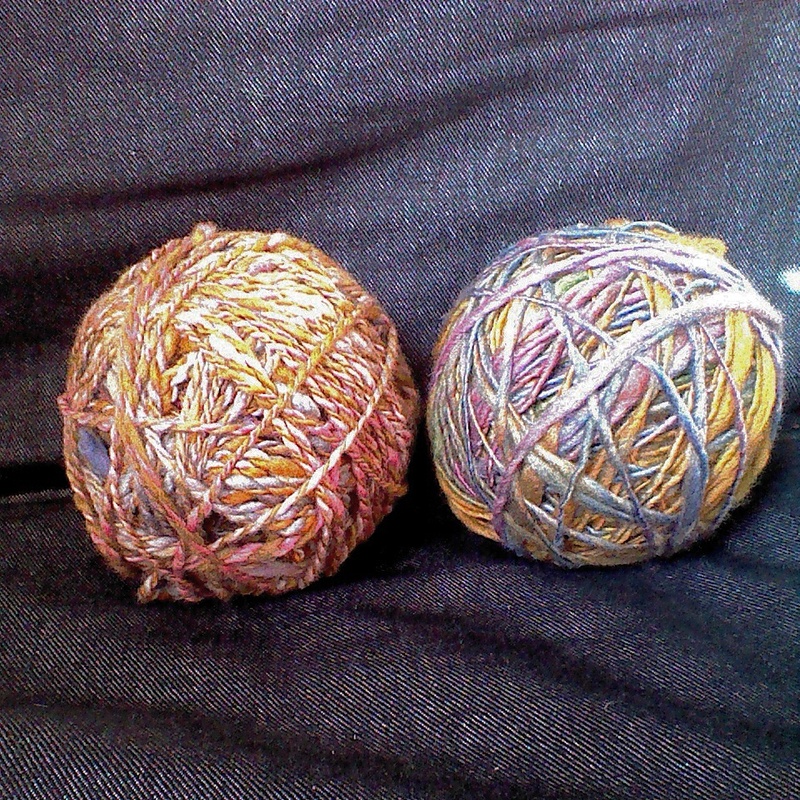 Both spun with the same fibre, but 2 ply on the left and single ply on the right. I love how the single ply brings out the beautiful self-striping, subtle effect I want to work with. This yarn is a bit wobbly and fluffy in places but generally pretty strong. The 2 ply is a stronger, more resilient yarn and I LOVE it, but for a sweater? Hmm, not sure about that one. What do you reckon? 2 ply or not 2 ply? This entry was posted in Spinning and tagged Craft, Handspun, Håndarbejde, håndspunnet, Knitting, Spinning, Strik, Wool, Yarn. Bookmark the permalink. 5 Responses to 2 ply or not 2 ply, that is the question..
Lovely colors! I like the single ply better, but that may be due to the visible colors. Happy knitting to you! Yes, I think you’re right there! Just a bit wary of how strong it would be, washing well etc…guess there’s only 1 way to find out! Yeah, I think I’m going for it. The only issue now is I’ve used up too much experimenting!